I read all sorts of books in different genres, including what some people refer to as “chick-lit”. I read these books because they have the “feel-good factor” and there are times when I want a good read with a guaranteed happy ending; they are something I pick up when I’m in need of a pick-up myself. Some of the stories are the equivalent of a McDonald’s for the eyes; they just slip down without too much effort on the part of the reader and often that is exactly what I need. But some are rather better than that. 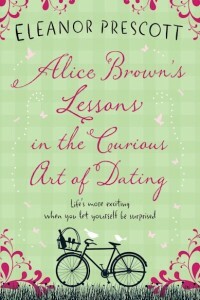 Alice Brown’s Lessons in the Curious Art of Dating is one such book. It is an easy read but it has a better than the average “feel-good” storyline. The plot is more convoluted and the story revolves around several central characters, each of whom has come to a turning point in their life. 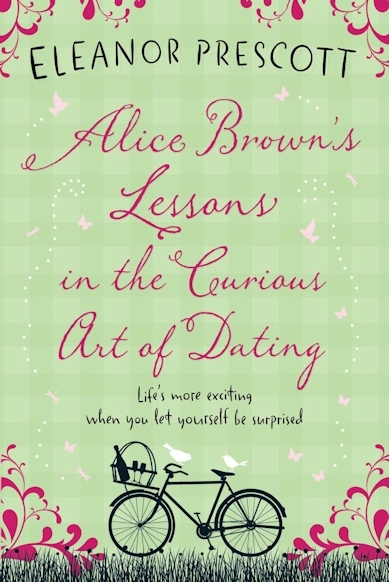 The Alice Brown of the title works at a dating agency run by Audrey, a rather severe and disapproving character. Audrey and her husband John attend the annual Dating Practitioners’ Society ball, where, under the influence of alcohol, some of the other characters make apparent their unsavoury personality traits. Alice is on the receiving end of some of the unpleasantness, and Audrey’s husband John stands up for her and comforts her. But it becomes apparent that John is not what he seems to be. There follows several turns in the plot and a lot of potential for misunderstanding which makes for a very enjoyable read. There are also several sub plots running alongside, which enrich the central plot and add depth to the main characters. The depth of the characters is what stands out the most for me about this book. They are very well observed and all come to life on the page. Most of them are extremely funny and I especially liked Audrey, the owner of the dating agency and Emily, the daughter of one of the main characters. They were both very well written and I could just imagine their conversations, especially Emily when she confronts Audrey who is all but stalking her father: (“you…have got to be Audrey”). These two in particular provide several “laugh out loud” moments, another essential component when I’m reading to be cheered up. Of course they all live happily ever after, even the less likeable characters, but this book certainly lifted the spirits and gave me a really good laugh, especially when Audrey and then Emily took centre stage. I hope Eleanor Prescott writes another book; I would certainly read it. Coming soon: an interview with Eleanor Prescott. I could use a good feel-good read. Putting this on my list. Thanks! Zazzy, I knew I could count on you to be enthusiastic! I believe it’s available on Kindle too. Sarah, I loved Eat, Pray, Love too. I don’t get much time to read either, so have to squeeze it in when I can, like you. Good luck with your own writing, can’t wait to read it one day! Hope you enjoy it Claire. I thought it was better than most of the others. Will put this on my list, I love it when you can laugh out loud at characters (like Lola in This Charming Man by Marion Keyes)! I’ve read a few of Marion Keyes’ books but not that one, will look out for it. You will certainly enjoy Alice Brown then! This book sounds charming to me. Will add it to my ever growing list of books to read. Thanks for the review. Thanks Ally, I hope you enjoy it.